This season, my husband and I have made it our goal to update our outdoor living space and try our hand at some basic herb and vegetable gardening. Years ago, we began using flower boxes to make the most of our limited outdoor space in our D.C. apartment. Now that we live in Florida and have a large yard, we still find that flower boxes are one of the best ways to grow plants and add style to our lawn and patio area. For those of you trying to decide which style of gardening is right for you, we've provided some of the biggest benefits that flower boxes and raised beds offer below. We've also included one of our favorite flower box recommendations, the IKEA Askholmen Flower Box, for its style, functionality and affordability. will fill this box in a handful of weeks! Animals: Living in the South, armadillos, ground hogs and other animals are a real problem for gardens. They burrow under fences and ruin gardens in no time flat. Raising your garden off the ground by planting in flower boxes helps to protect your herbs and veggies from animal invasions. Weeds: Weeds are a never-ending battle when you plant in the ground. We find that weeds are rare in our flower boxes and it cuts out the time-consuming task of weekly weed pulling. Mobility: We love that flower boxes allow us to rearrange our outdoor space as we see fit! 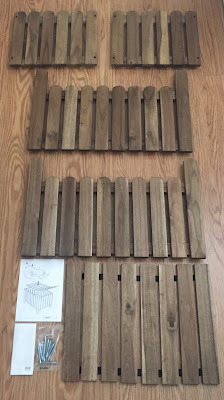 Being able to redesign things without working around or losing our garden altogether is one of my favorite things about planting in wooden boxes. Control: It's very important to know how your plants typically grow before you plant them. Though we love having fresh mint on hand, we know this plant will grow out of control in the ground and take over a garden. Planting in a flower box keeps our mint in check. Faster Growth: Plants in flower boxes tend to grow faster. This may be because the soil in the box warms up faster than the soil in the ground. Easy Labor: Gardening in the ground requires a variety of large tools and a substantial amount of heavy lifting and bending. Flower boxes can save back pain and only require one or two light-weight tools to maintain healthy plants. The IKEA Askholmen Flower Box actually allows you to place the shelf at the bottom of the box or raise it near the top for even easier access to your plants. 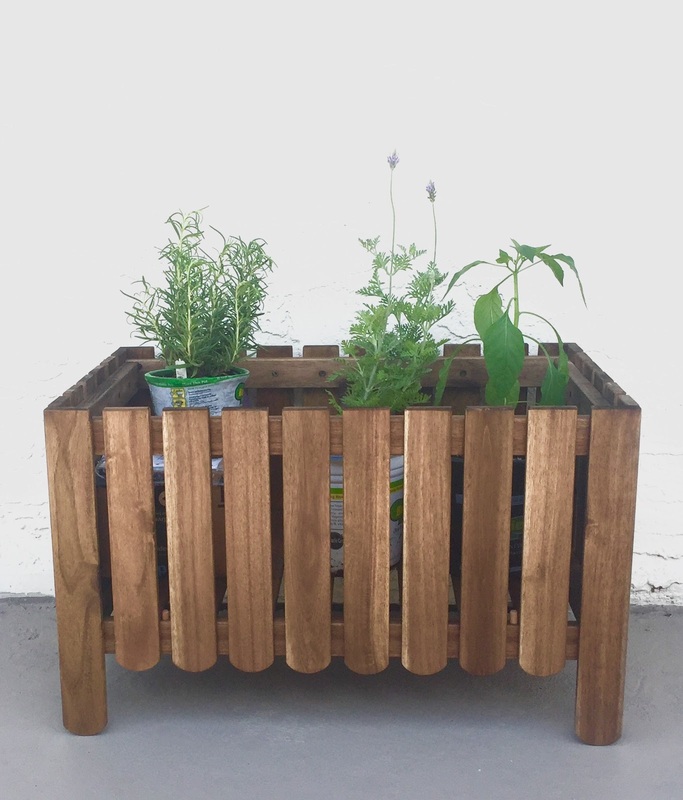 This flower box is constructed of solid acacia wood planks with an acrylic stain that weathers the frequent rain storms we experience here in Florida. For added durability, it has been pre-treated with a layer or semi-transparent wood stain that also adds beauty to the box and emphasizes the natural expression of the wood. We love that the inner shelf can be placed in the bottom of the box for maximum depth or raised higher for closer access and display options. We are able to fit three quart size pots of herbs in the flower box comfortably, with a decent amount of room to spare for growth. The Askholmen Flower Box really gives a modern, upscale look to our outdoor space. For thirty dollars, you can't beat it! Assembling this flower box was a breeze. It comes in five pieces and IKEA provides the screws and the tool to put it together. My husband and I had it together in less than ten minutes. The bottom shelf which inserts into the flower box can be adjusted using the small pegs provided, so that you can raise or lower it as you see fit. It really couldn't have been easier. Check out the IKEA website to order your flower box directly to your door or use the IKEA store locator to find a local store near you. Disclaimer: The Askholmen Flowe Box in this post was provided by IKEA Orlando. As always, our posts are our own, honest opinions.